In 1861, Colonel Abraham S. Vosburgh died from noncombat causes. Following a well-attended military funeral, he was buried in Brooklyn's Green-Wood Cemetery. This is the base of his monument, which features an obelisk topped by an eagle. The monument was commissioned by Vosburgh's regiment and designed by noted sculptor Patrizio Piatti, who is also buried in Green-Wood. 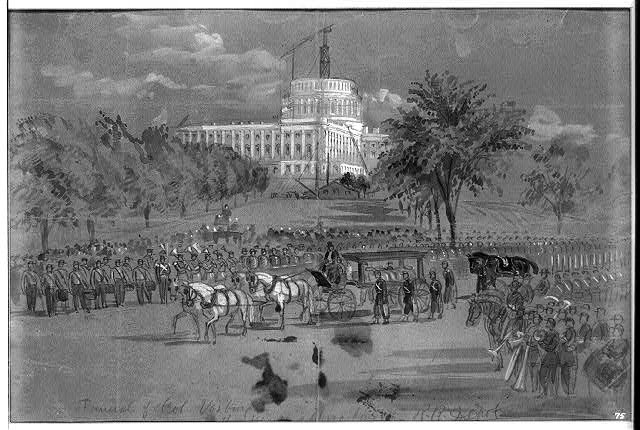 The scene in Washington, D.C. as Col. Vosburgh's casket was borne to the railroad station for its journey to New York.